Last month, we blended our first batch of Tanteo Habanero Tequila, bringing our family of spicy Tequilas to three. Most ordinary tequilas come in threes: a blanco, reposado and anejo. With the new launch we now have our original in Tanteo Jalapeño, our smokey expression in Tanteo Chipotle, and our extra spicy infusion in Tanteo Habanero. I wanted to share today our reason for creating Tanteo Habanero, our unique production process, and some of our favorite ways to use the new infusion in cocktails. We created Tanteo Habanero for a simple reason - some like it hot. While our award winning Tanteo Jalapeño Tequila fuels our company’s growth by making the perfect Jalapeño Margarita, we still have those “spice-head” fans where nothing is hot enough. That is where Tanteo Habanero comes in. We are unapologetically spicy with our Habanero infused tequila, using real habaneros, so use caution when drinking it neat. We needed to use Habaneros, as they have a rich history in Mexico, and are the hottest pepper readily available. We use only Mexican Habaneros from the Yucatan Peninsula where the hot and caribbean like climate allow for optimal and year round growing of habaneros. While ripe habaneros can grow red, brown, yellow, or purple - we only use orange habaneros for our tequila. Our habaneros are not the hottest peppers out there, but have a pleasant tropical nose that pair well with many of our favorite cocktails. Once our habaneros are harvested they are brought to the distillery where they are infused in our overproof blanco tequila. 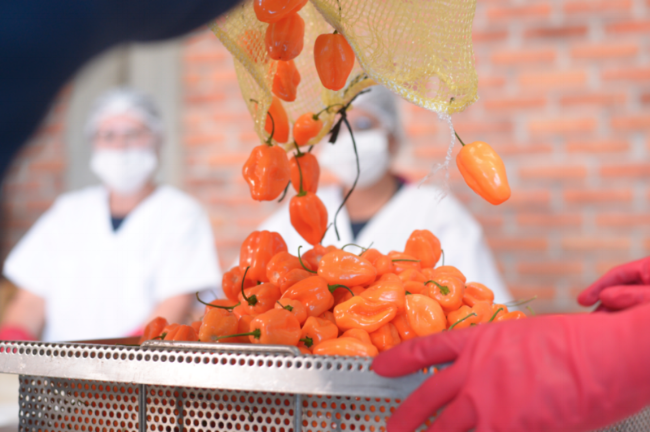 Like Tanteo Jalapeño and Tanteo Chipotle, we use different cuts of Habaneros to make our macerates. For one macerate, we use slices of habaneros with the pith and seeds; though in general, habaneros have many fewer seeds and pith than our Jalapeños and chipotles. For another macerate, we cut the Habaneros in half, hollow out the pith and seeds, and let them infuse in overproof tequila. Once we make these macerates, I get to work in the lab blending them together to create the perfect combination of heat, habanero’s tropical aromas, and of course our blanco tequila. I am also very cocktail focused during the blending process and spend a lot of time making margaritas with the samples of tequila to make sure they shine both neat, on the rocks, and in a margarita. Because Tanteo Habanero is significantly hotter than Tanteo Jalapeño or Tanteo Chipotle, the blending process is more difficult and my palate gets “shot” much quicker. I drink lots of water, eat lots of saltines, and take lots of breaks as I sift through samples to create the perfect habanero blend. The fruits of this labor-intensive process is a wide variety of cocktail creations with Tanteo Habanero. While the perfect margarita recipe is the same for all three of our tequilas (2 oz Tanteo, 1 oz fresh lime juice, ¾ oz agave nectar), the applications do not stop there. The spice of the habanero is intensified with other citrus fruit, from grapefruit, tangerine, and blood orange, and also works well with a number of tropical fruits from mango, passion fruit, and tamarind. We are very excited about getting back to offering three unique spicy tequilas, though it will take some time for our distribution to get out. We are launching Tanteo Habanero August 1st in New York, Florida, Massachusetts, California, and Georgia, and will start to roll out more states in 2018. Keep up to date with all of our best cocktail applications @tanteotequila and be sure to tag us when you are out enjoying a Tanteo cocktail.